Jawatan Kosong 2019 di ExxonMobil Exploration and Production Malaysia Inc. | Permohonan adalah dipelawa daripada Warganegara Malaysia yang berkelayakan dan berumur tidak kurang dari 18 tahun pada tarikh tutup iklan ditawarkan untuk memohon jawatan kosong terkini di ExxonMobil Exploration and Production Malaysia Inc.
ExxonMobil is one of the major crude oil producers and suppliers of natural gas in Malaysia. It operates under four production sharing contracts (PSCs) with the Malaysian national oil company, PETRONAS, producing about one-fifth of the nation’s oil production and about one-half of natural gas supplies to Peninsular Malaysia. In chemicals, ExxonMobil has a strong market position, supplying a portfolio of specialty products to the growing marketplace. The ExxonMobil Business Support Center in Malaysia hosts the company’s IT organization and provides support across the globe. Additionally, the ExxonMobil Research and Engineering Global Support Office provides technical, engineering and application support for ExxonMobil’s refineries around the world. 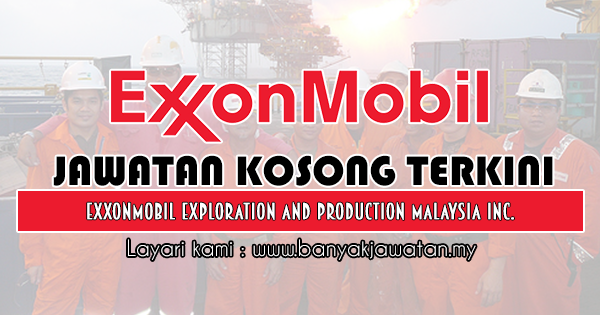 0 Response to "Jawatan Kosong di ExxonMobil Exploration and Production Malaysia Inc. - 28 April 2019"